So imagine I’ve invited you to a Starbucks to catch up and and we find a table next to the window where we can sit and chat for a few minutes. There’s a 95 percent chance I order a butterscotch latte and I’m rambling about how much I love butterscotch lattes and how Starbucks is dumb for only offering it seasonally. Seriously, since when is butterscotch seasonal? As I’m telling you about my plan to force Starbucks to make the smoked butterscotch latte a permanent fixture on their menu, I realize that your eyes are starting to glaze over. So I take one last sip of my latte and decide to switch gears. After all, there’s a reason I wanted to talk with you. Not long ago I was working on another blog post and as I was writing it, I couldn’t shake this feeling. The post, which I’m hoping to publish at some point, is basically based around the premise that you don’t have to be an expert in order to be an example. Problem was, I’m not feeling like much of an example myself. Words like fake, fraud and impostor began to pop into the forefront with every word typed. That last word struck me. Impostor. It’s such a strong word. I looked it up and it means “someone that assumes false identity or title for the purpose of deception.” I got this image in my head of some guy in a crowd from an old black-and-white movie pointing at the camera -- at me -- and yelling “You, sir, are an impostor!” Worst yet, for a while, I believed him. When it came down to the heart of it, I felt unworthy of the words I was writing. Thanks, Random Guy In My Head. I didn’t watch the Oscars this year. I usually don’t; I’m not a big fan of all these awards ceremonies. Besides, the only film nominated for Best Motion Picture that I watched was Hidden Figures (amazing movie, by the way) and following the festivities on Twitter is more entertaining and informative than the Oscars themselves. While everyone was in shock over the “Moonlight/La La Land” fiasco (you can go in peace now, Steve Harvey), another Oscar-related headline on my news feed caught my eye: Oscar-winning actress Viola Davis says she struggles with 'impostor syndrome'. Huh. I’m not too familiar with Viola Davis or her work (I know her best from the movie Disturbia and the 1,023,632 commercials I’ve seen promoting the hit show How To Get Away With Murder), but the headline captured my attention. How could an Oscar Award-winning actress, someone who has had such a successful career, feel like an impostor? I saved the link and told myself I’ll get to it later. After having that mental crisis as I was writing that post I was talking about earlier, I went back to read that article and learned that the “impostor syndrome” means feeling a “sense of phoniness despite evidence of high achievement.” A recent study showed that around 70 percent of people will experience this syndrome at least once during their lifetimes. While it was initially believed that women were the ones who mostly suffered from this syndrome, it's apparent now that men do, too -- we just tend to hide it better. In fact, people from all kinds of backgrounds experience this feeling. No one is immune. That fear of being “found out” is probably one of the most suffocating feelings we could ever experience. We’re social beings. Deep down, we long for connection with and the acceptance of those around us. We want to love and be loved for who we are. But we’re afraid that if they get too close, because we think if they see us for who we really are underneath the surface, that they will reject us and see us as we see ourselves: as impostors undeserving of success, of love, of acceptance. And on a spiritual level, we fear the same with God. I know I do. We doubt ourselves like Moses did and ask “Who am I” to lead or to be used by God? We point to our weaknesses like Gideon, who said that he was part of the weakest clan in the tribe and the least in his own family. You got the wrong guy, Gideon probably thought. I’m sure they felt like impostors, too. But God called them to do something great anyway. Maybe not even in spite of Moses’s and Gideon’s weaknesses and shortcomings and doubts and their views of themselves, but perhaps because of them. That seems to be God’s standard operating procedure: to take the very thing that we think is a weakness and repurpose it for His glory. God wanted to use them -- and did use them -- to accomplish great things. And he wanted to do so as they were. I know He wants to do the same for you and me, regardless of how we view ourselves. I'll take His word over my own every day of the week and twice on Sundays. Maybe we can cut ourselves a little slack now and then. Maybe we can celebrate who God made us to be and what He has helped us accomplish up until now. Maybe we can rest in the fact that He’s not finished with us yet. 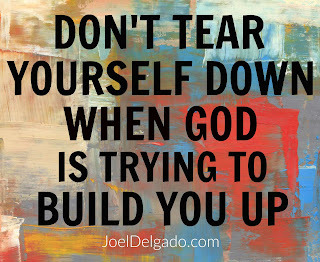 Don’t tear yourself down when God is trying to build you up. Before I write another word on another post, I want to make one thing clear if it wasn’t clear already: When I’m writing something to you, I’m always writing it to myself, too. I’m challenging myself to put into practice the lessons and insights God is speaking into my life, even when I don’t fully grasp them myself. Along the way, the enemy will try and twist those challenges into accusations. He’ll try to convince me that I’m not good enough, smart enough, disciplined enough, fill-in-the-blank enough. He’ll try to convince me that I am an impostor. But in the face of the impostor syndrome, we can rest in the fact that God knows us, each and every one of us, more than anyone else can -- more than we know ourselves -- and He still loves us. He still accepts us, wants to know us, wants to help us grow and wants us to know who He is. He says that I am enough. He says that you are enough. When we forget that, we can go right back to God's word. Read Psalm 139. He knows everything about you, from your inner-most thoughts and fears to what you’re going to say before you even say it. Nothing about our lives is hidden from Him, and yet His thoughts about us are precious and when we wake up in the morning, He is still there with us. I don’t have it all together. I don’t have all the answers. If I said I did, then that would make me an impostor of the worst kind. I’m just trying to grow and learn and follow Jesus the best way I can. I don’t always feel like it and I’ll fail and stumble along the way. But that’s part of the journey and the process. It feels ike you just put my feelings on paper! Whenever I am up for an interview, or someone asks me to introduce myself, I have a mini existential crisis!